We need your help. 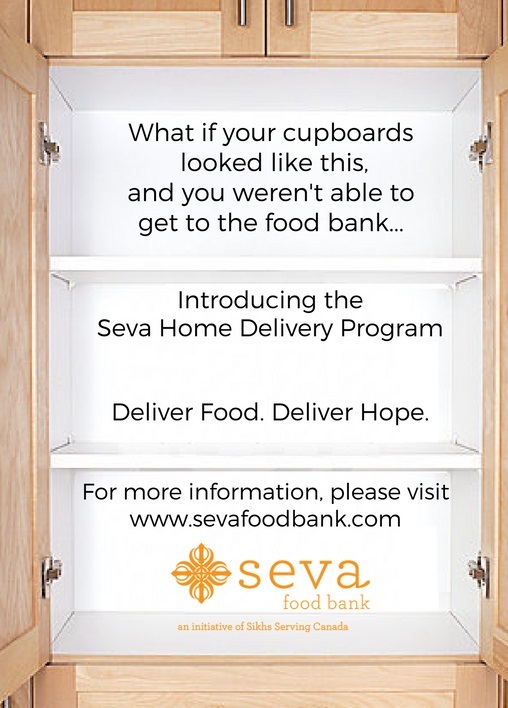 Seva Food Bank is launching our new Home Delivery program. In our communities, there are many who struggle to afford food and it can be challenging to seek assistance. Overcoming this barrier is no easy task for anyone—and for someone with mobility issues due to age, physical disabilities, mental health, or chronic illness, getting support can seem next to impossible. We need a Home Delivery program. There is a high need for a home delivery program in Mississauga, and Seva Food Bank is one of the only organizations ready to address it. We currently have ten families registered for our home delivery program, with the current capacity to provide only a few more. Turning away clients who need help the most is not an option. Your contribution to Seva’s home delivery program will fund its essential logistics— transportation to and from clients, healthy and appropriate food that will last 10-14 days, and designating staff to make the initiative possible. The donation you make will go directly towards addressing the needs of some of the most vulnerable and marginalized individuals in our community. Providing clients with the ability to cook and prepare their own meals means that our clients will be able to maintain their independence, ensure a high quality of life and become self-sufficient. With the home delivery program, we have the potential to impact hundreds of lives, and it all begins with your support.Our partners at the Community Foundation of Mississauga have given us a generous grant to cover part of the costs. However we still need to raise more to cover the full cost of the program. With your help, let’s raise $20,000 so that together we can deliver food and deliver hope.